Oil prices have performed unexpectedly well this quarter, rising roughly 29.5% YTD despite US-China trade developments, global growth concerns and ongoing oversupply fears creating headwinds for the commodity. Although the appreciation witnessed is likely based around optimism over OPEC supply cuts and bouts of Dollar weakness, the medium to longer term outlook remains clouded by multiple risks down the road. OPEC + has assured markets that its members will stick with production cuts through June; a move that should be supportive for oil prices in the coming months. However, it’s a tougher call trying to determine what will actually transpire in the markets over the coming months. Even some of the world’s most influential producers can’t seem to agree on present market dynamics. Saudi Energy Minister Khalid Al-Falih this week said there remains a “significant glut” in global supplies which still needs to be drawn down, before considering easing production cuts. However, the Russian Energy Minister Alexander Novak recently insisted that current prices are “acceptable to all parties”. With conflicting messages from OPEC and Non-OPEC heavyweights adding another element of uncertainty into the mix, questions should be raised over the sustainability oil’s current bull run. While the US could still offer Oil bulls a boost in May, given reports that US President Donald Trump is contemplating tightening sanctions on Iran, the question is for how long? It must be kept in mind that further confirmation of slowing global growth will weigh heavily on oil prices. Fears about weaker oil demand are set to intensify if repeated signs of faltering Eurozone growth, Brexit uncertainty and growing concerns over decelerating US growth remain major market themes. This month, OPEC+ producers hope to exceed 100 percent compliance to its output cuts programme, which is intended to remove 1.2 million barrels per day from the world’s oil markets through the first half of 2019 at least. It remains to be seen whether that will be enough to offset supply-side risks, political instability in OPEC member countries such as Algeria and Venezuela, record output out of the US, as well as US sanctions on Iran and Venezuela. And all that’s set against a backdrop of waning global growth. Such potential risks in the pipeline could very well obstruct attempts to rebalance the markets in the second half of the year, and may dampen hopes of Oil once again exceeding the $80/bbl mark as it last did in early October. Gold bulls were clearly back action this week thanks to a depreciating Dollar and growing expectations over the Federal Reserve striking a dovish tone when it meets this week. Geopolitical risk factors in the form of Brexit and global growth concerns are also supporting appetite for safe-haven assets with Gold catching the attention of many investors. The precious metal certainly has scope to build on current gains if the Federal Reserve not only adopts a cautious stance but cuts growth forecasts and revises down their dot plot for 2019. 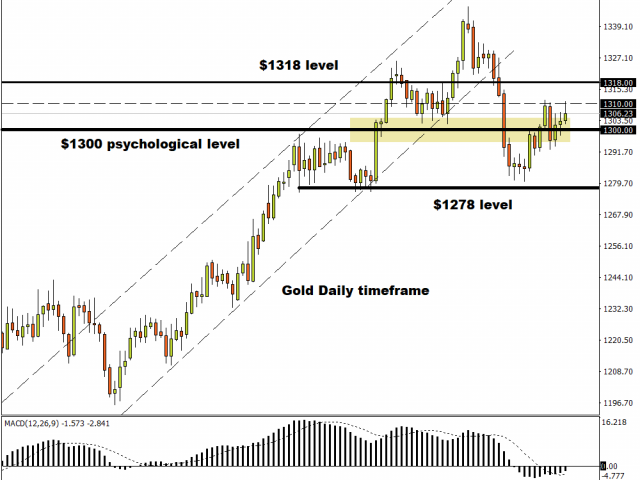 Taking a look at the technical picture, Gold bulls remain in the driver’s seat above the psychological $1300 level. An intraday breakout above $1310 is likely to open a path back towards $1318.